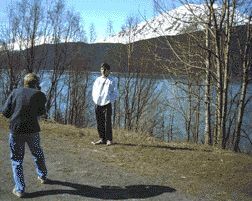 Alaskan scenes wouldn't be realistic if they didn't include people taking photographs. Above, a tourist trains his video camera on Cook Inlet at Beluga Point, 15 miles southeast of Anchorage. Beluga Point, as its name suggests, is a good place for whale watching. Summer is the high season for tourism in Alaska, but Alaska's winter has its attractions, too. 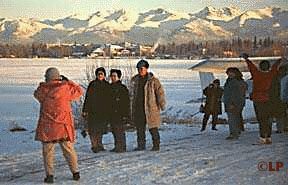 Below, Japanese tourists pose for photographs at Lake Hood in Anchorage. Lake Hood is a busy seaplane airport in the summer, a skiplane airport in the winter. 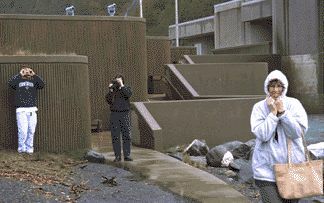 Even Alaskans can be found behind cameras. 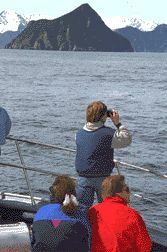 The boy at the railing of the tour boat in Kenai Fjords National Park is from Anchorage. The tourists using Kenai Lake - the biggest lake on the Kenai Peninsula - as a backdrop for their photography live near an even bigger lake, Lake Baikal in Russia. Portage Glacier, an hour's drive from Anchorage, is the most visited tourist spot in Alaska. These Minnesota tourists are looking across iceberg-filled Portage Lake toward the glacier. You are looking at the Begich-Boggs Visitors Center.